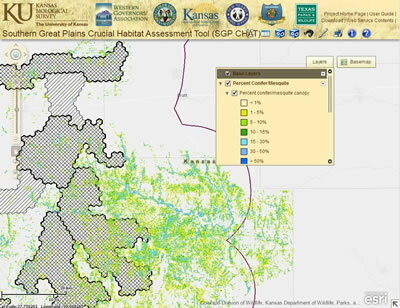 A new woody encroachment data layer — available through the Southern Great Plains Crucial Habitat Assessment Tool (CHAT) web map — provides a broad-scale planning tool for resource managers to more effectively target Lesser Prairie-Chicken (LEPC) habitat improvement strategies. The data depict the extent and canopy cover of woody encroachment across the bird’s five-state range, which encompasses portions of Colorado, Kansas, Oklahoma, Texas, and New Mexico. By identifying five levels of canopy cover, from low to high percentage, it enables cost-benefit analyses for woody plant removal and offers a starting point for management planning. Two species are responsible for most woody encroachment in the Southern Great Plains — eastern red cedar on the east side of the range and mesquite on the west side. Historically, regularly occurring fire killed off woody plants on the plains, maintaining prairie grasslands. Since settlement, fire suppression has allowed cedar and mesquite to encroach onto grasslands, degrading habitat for grassland wildlife and reducing forage base for livestock grazing. Researchers estimate that red cedar is encroaching at the rate of more than 275,000 acres per year. The assessment of woody encroachment in the Southern Great Plains was completed by researchers from the University of Minnesota, in partnership with the Lesser Prairie-Chicken Initiative. Access the new mapping layer at http://kars.ku.edu/maps/sgpchat/. Turn on the woody encroachment mapping layer by clicking the box next to “Percent Conifer/Mesquite” near the bottom of the layers list.